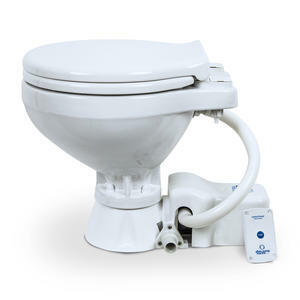 Standard electric compact toilet with a combined electrical 12V macerator and pump for waste disposal and flushing in one single operation. Including one touch electrical control panel. 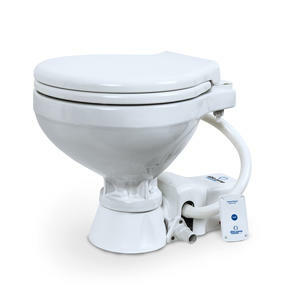 Easy to clean white ceramic bowl and white wooden seat. 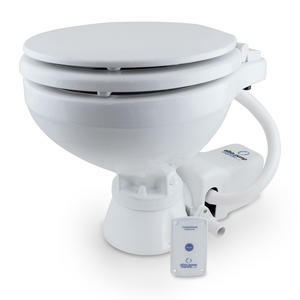 Stable base for robust installation, plug & play/ interchangeable with Jabsco 37010-0090, Johnson Pump 80-47435-01 and other single operated electrical toilet models.